How do you experience anticipation? Are you like a kid shaking wrapped packages, getting ready to tear in? Or does it feel like that tick-tick-tick climb up a rollercoaster on the way to that first thrilling drop? Sometimes, though, anticipation can turn to dread, if you’re afraid of what’s around a dark corner. When it comes to anticipating market twists and turns, we’ve learned that knowledge is the key to keeping dread at bay. Buying ingredients and managing your spend require you to make many predictions. Shifts in consumer demand affect the decisions of ingredient buyers and sellers alike. New food safety requirements limit supplier choices. Changes in the transportation landscape may push freight costs higher. These and many other factors add complexity to supply chains. Gaining an early glimpse into elements that will impact commodities will help you make more informed and effective decisions. 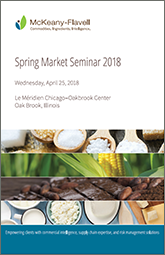 Join us for our fourth annual Spring Market Seminar and let McKeany-Flavell’s experts show you more than a peek at which factors will shape how you buy ingredients—and how much you pay for them. Maybe we can’t control the future, but we’re pretty good at shining a light on what’s around the corner. WHEN: Wednesday, April 25, 2018, 8:00 a.m. to 4:30 p.m.